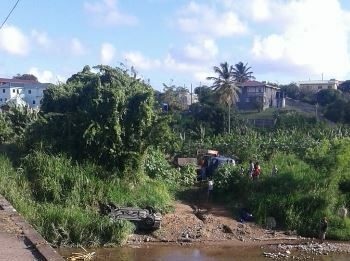 A young driver escaped serious injury after the car he was driving veered off the Troumasse river bridge in Micoud and overturned on the river bed below, an emergency official has confirmed. The incident occurred Sunday morning between 4.00 and 5.00 am, according to the official. According to reports, the vehicle was heading North at the time. The emergency official told St Lucia Times that the driver, believed to be in his twenties, may have fallen asleep at the wheel since he told responders that he could not recall what happened. The vehicle, a Lexus IS 200, was a write-off, St Lucia Times was informed. He needs to count his blessings, praise God he is alive! I was wondering how the vehicle disappeared. Other drivers were smart to get off the road. He was driving way too fast. Did he really fall asleep? That happened after 3:00. No he was not driving too fast! And yes he fell asleep. He was heading home after his staff party in soufriere. He lives in Micoud so he was almost home when it happened. What else u want to know. Mofos always Quick to judge.